Author(s): Béla Gyurcsik. Department of Inorganic and Analytical Chemistry, Faculty of Science and Informatics, University of Szeged, 6720 Szeged, Dóm tér 7, Hungary. Artificial nucleases are designed for in vivo gene engineering, as the DNA cleavage performed at a specific target site enhances the effectiveness of the cell’s DNA repair machinery. The therapeutic potential of the above phenomenon stems from the knowledge that (i) the shifted reading frame can be restored by non-homologous end-joining, or (ii) a DNA of erroneous sequence – causing a genetic disease – can be corrected by homologous recombination in the presence of a suitable DNA template. Besides the advantageous properties of the nowadays applied zinc finger nucleases, TALE nucleases and the CRISPR/Cas9 system, they possess a residual citotoxicity. This is related to offtarget cleavages, which could be prevented by the strict regulation of the enzymes. The studies on enzymes acting naturally in a controlled manner are beneficial to get better insight into their mechanism. Such enzymes or their appropriate domains may be the most promising alternatives to the presently applied ones. 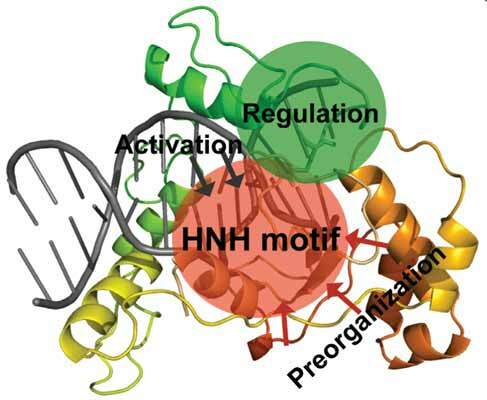 As an example, the DNA cleavage of the inactive HNH nuclease mutants is inducible in a multiple way. This property may be used for establishing a control mechanism and thus, in combination with specific DNA-binding domains they are good candidates for the catalytic site of artificial nucleases. Here we collect the results on the properties of the HNH nucleases that allow for their redesign into enzymes with possible therapeutic applications. Keywords: Allosteric control, Artificial nuclease, CRISPR/Cas, HNH motif, TALE, zinc finger. Affiliation:Department of Inorganic and Analytical Chemistry, Faculty of Science and Informatics, University of Szeged, 6720 Szeged, Dóm tér 7, Hungary. Keywords:Allosteric control, Artificial nuclease, CRISPR/Cas, HNH motif, TALE, zinc finger. Abstract:Artificial nucleases are designed for in vivo gene engineering, as the DNA cleavage performed at a specific target site enhances the effectiveness of the cell’s DNA repair machinery. The therapeutic potential of the above phenomenon stems from the knowledge that (i) the shifted reading frame can be restored by non-homologous end-joining, or (ii) a DNA of erroneous sequence – causing a genetic disease – can be corrected by homologous recombination in the presence of a suitable DNA template. Besides the advantageous properties of the nowadays applied zinc finger nucleases, TALE nucleases and the CRISPR/Cas9 system, they possess a residual citotoxicity. This is related to offtarget cleavages, which could be prevented by the strict regulation of the enzymes. The studies on enzymes acting naturally in a controlled manner are beneficial to get better insight into their mechanism. Such enzymes or their appropriate domains may be the most promising alternatives to the presently applied ones. As an example, the DNA cleavage of the inactive HNH nuclease mutants is inducible in a multiple way. This property may be used for establishing a control mechanism and thus, in combination with specific DNA-binding domains they are good candidates for the catalytic site of artificial nucleases. Here we collect the results on the properties of the HNH nucleases that allow for their redesign into enzymes with possible therapeutic applications.